Chennai's Chepauk stadium has invented a brilliant way to keep Test Cricket from being engulfed by the IPL. In fact, this invention will resurrect Test Cricket and make it more interesting than any T20 league in the world. 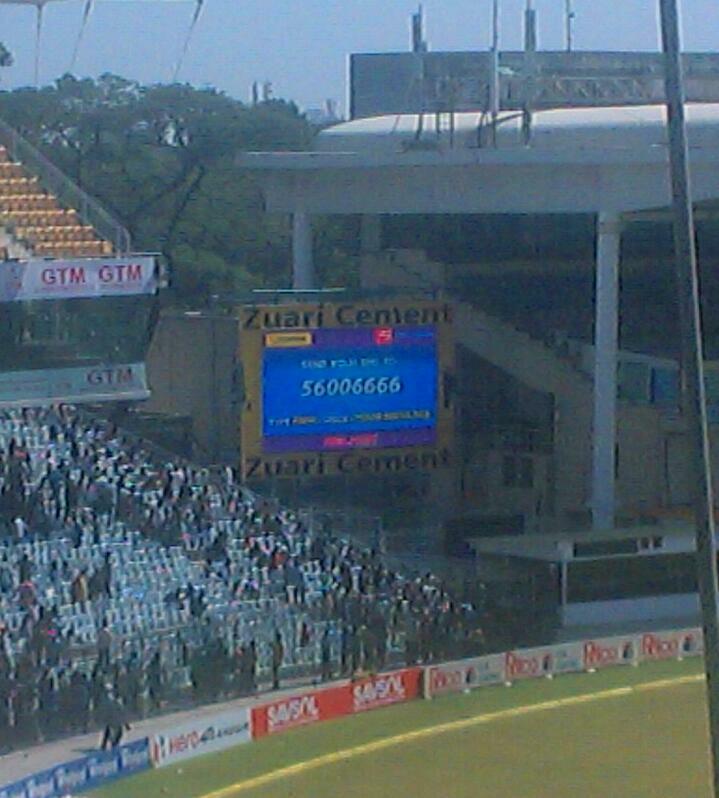 Most of you who visited Chepauk might be familiar with this blue screen surrounded by Zuari Cement in the picture. It is called the 'message board' or the 'interactive board', which asks you to send your messages to 56006666 so that the knowledgeable Chennai crowd can see your wonderful thoughts on the screen and think about agreeing to disagree with your comments. And here is the highlight: all the thrill and exciting experience at a meager cost of Rs.3 per message. Apologies for the quality of the photo. It doesn't reflect upon the quality of messages on the board. Do not underestimate the power of this blue screen. It plays Jedi mind tricks on everyone, including the players. During the second day's third session, when Sachin Tendulkar was at his best, a message in big bold white letters from a relatively unknown person called Shiva [name changed on request] flashed on the screen. "Who wants to see Sachin bat tomorrow, pls raise ur hands," it read. Australian captain Michael Clarke, who desperately wanted Sachin out, momentarily lost control of his own actions and raised his hand, thus receiving a huge round of applause from the crowd. While few knowledgeable uncles argued that Clarke raised his hands to itch his armpit, most of them were convinced that Michael Clarke was more than pleased with Sachin batting continuously for the rest of the match. The chain of actions and alleged assumptions were triggered by a simple combination of ASCII characters with absolute disregard for spelling or punctuation on the blue screen of infinite power, which will, believe it or not, revolutionize Test Cricket. You might argue that this conclusion might be far-fetched but here is another incident that might change your stance, unless you are Ravindra Jadeja. A 44 year old uncle from the convoluted streets of Mylapore had accompanied his son to watch the match. He made his son walk several times from the top of the D-Upper Tier stand to get him snacks and cool drinks. This is however irrelevant to the point I am trying to convey. He was reading out every message from the blue board aloud to his son and often clarified what the message was demanding us to do. He obliged to the infinite number of pointless Mexican waves, whistled when the message asked us to whistle for Dhoni and shouted when it read, "Dhoni in Viswaroopam idhu from Kamal fanzz." In fact he was so engrossed with what an occult group called 'Powerstar fan club' said to us that he missed Ravindra Jadeja posing for the cameras after magnanimously leaving the ball to hit the stumps. Like all Chennai people, he made a generic comment about how Jadeja's shot selection was poor and he went back to reading messages from 'Ilayathalapathy rocksss.' The blue screen had worked its way through the psyche of an intelligent Indian cricket supporter from Chennai, which is not easy by any means. During Ravichandran Ashwin's brief innings, he was asked to raise his bat for the whistles. Of course he obliged. There was a message war of sorts during the lunch break, in which fans of various Kollywood actors were pitted against each other by the 'message board'. Ilayathalapathy fans were countered by Thala fans while Rajni fans got unanimous cheers, thus inspiring Kamal fans to raise to the occasion. The stadium was loud and enthusiastic despite having no men in white clothes playing with a red ball in the middle. And there were so many other countless incidents where the 'message board' was the center of attention. This was not about Test Cricket any more. "Always the white words watching you and the imaginary voice enveloping you. Asleep or awake, working or eating, shouting or whistling, in the bathroom or in the chairs -- no escape. Nothing is your own except the few cubic centimeters inside your skull." The Blue Board is the future of cricket, at least in this part of the world. Another gem mama!! You are TOHTALLY the rocks!! Congrats on the blog getting featured in DC supplement today. The blog looks interesting and will definitely come back for more. *Following the blog now. Cheers! This post is great.your article is important and helpful for cricket.This post give more new informative information for cricket.Thanks a lot for share your great post.